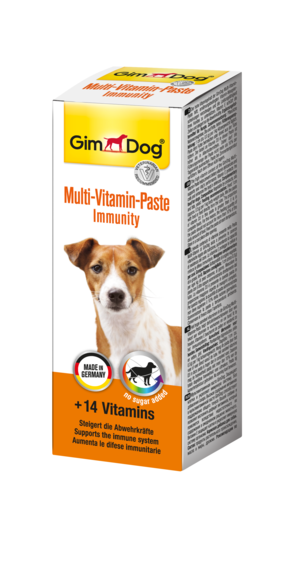 The high vitamin content of the GimDog Multi-Vitamin-Paste helps prevent dietary vitamin deficiencies and supports your dog’s performance. Vitamin E protects the cells and enhances the body’s defences. Feed 1 cm (approx. 0.5 g) per 1 kg body weight daily. Mix the paste with food or feed directly from the tube. The proportion of vitamin D3 in this paste is greater than it is in complete foods. For this reason, the feeding quantity of the paste should not account for more than 10 % of the daily amount of food.